Count on Scout and his pals to show you the fundamentals of beginning math with this fun-filled, interactive activity book for LeapStart™—the interactive learning system designed to get your child ready for school and life. 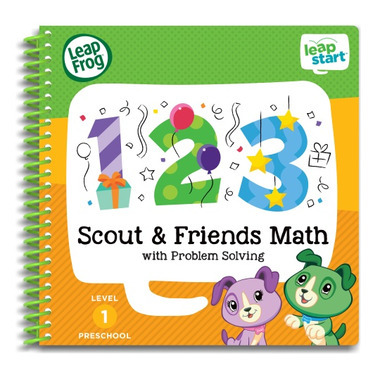 LeapFrog® LeapStart™ Scout & Friends Math with Problem Solving Activity Book is jam-packed with 40+ replayable activities that engage kids ages 2-4 at the preschool level to keep them playing and learning for hours. With the LeapStart system, every page talks, sings and jokes with exciting audio interactions that bring learning to life. Join puppy pal Scout and his favourite friends as they play and explore counting, number recognition and problem solving. Count all the butterflies you can find, and then sing along to a cheerful ditty about butterflies. Trace numbers to make sure you have the right ingredients for your recipe, and then “bake” a cake. End the day with a dance party where you can learn numbered dance moves to boogie down. 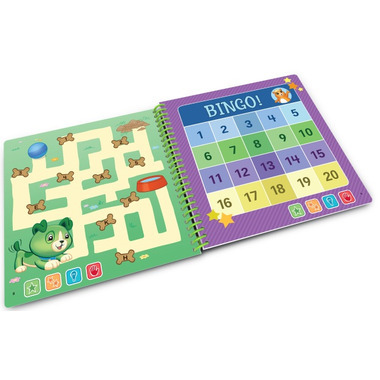 With this LeapStart book, kids explore 12 preschool math and problem solving skills, including matching quantities to numbers, counting to 10, tracing numbers 0-9, comparing sets of objects and more. Activities are designed around fun, friendly characters and familiar topics like music, food and the outdoors to help kids see opportunities to use mathematics in the world around them. Great learning product! This book has lots of activities that make counting fun.